Imleria badia (syn. Boletus badius; Xerocomus badius), the Bay Bolete, is common in spruce and pine forests and occasionally appears also under oak, beech and chestnut trees. 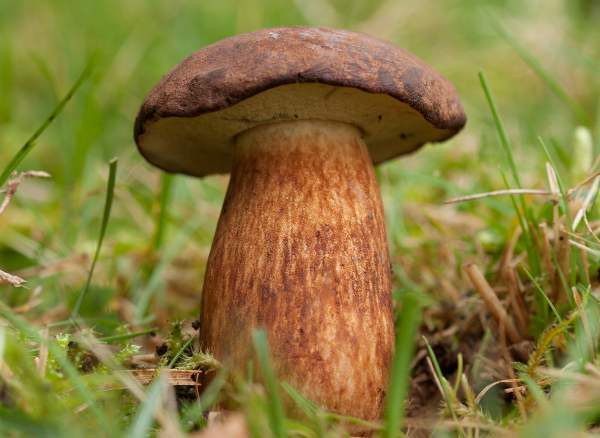 Late summer and autumn is the main season for this good edible bolete, which is comparable in flavour with Boletus edulis, the Cep or Penny Bun, and has the advantage of being less frequently infested with maggots, even when the cap has expanded fully. The common name Bay is in no way a reference to a seaside habitat but simply to the colour of the cap of Imleria badia, which is a bay brown (chestnut) colour. 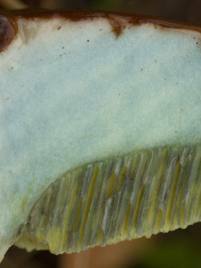 The stem is one of the most obvious defining features of this edible mushroom; it is neither smooth nor reticulate (covered in a net pattern) but lined vertically with shallow brown ridges on a paler background. 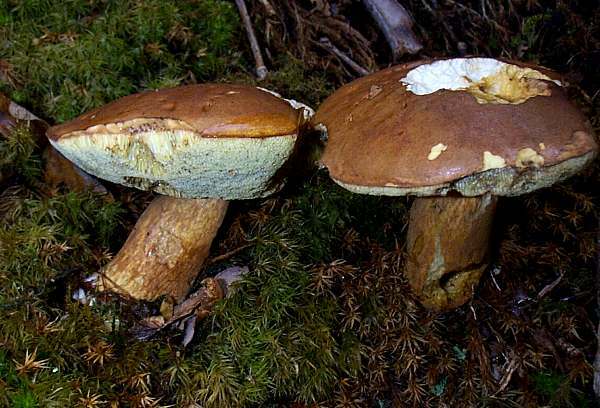 A fairly common and widespread species in Britain and Ireland, the Bay Bolete is found throughout temperate parts of Europe and North America. Although Bay Boletes are common finds, they are not particularly gregarious mushrooms, and it is rare to find more than two or three in a group; however, on occasion I have found groups of up to four or five beneath an aged pine tree. The great Swedish mycologist Elias Magnus Fries described and named this mushroom in 1821, giving it the name Boletus badius. 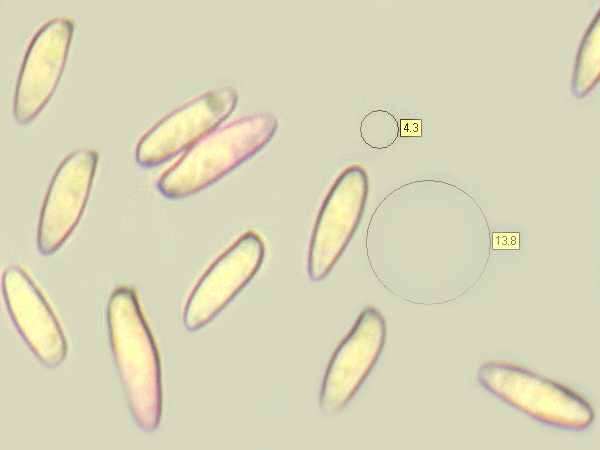 In 2014 Italian mycologist Alfredo Vizzini erected the new genus Imleria for this species, based on the uniqueness of some of its morphological features and on DNA analysis reported in 2013. 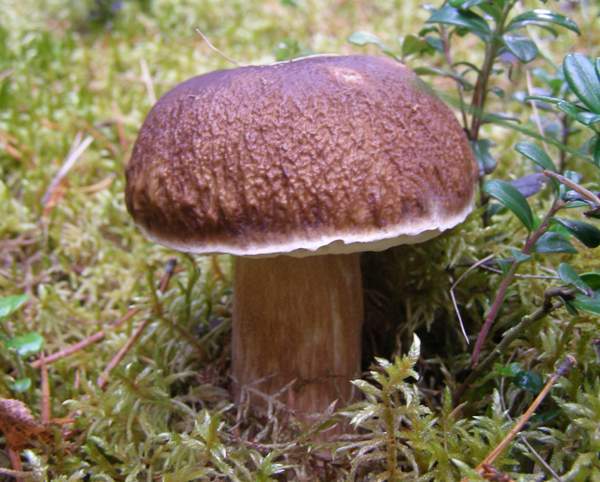 Synonyms of Imleria badia include Boletus badius (Fr.) Fr., Boletus castaneus ß badius Fr. , Ixocomus badius (Fr.) Quél., and Xerocomus badius (Fr. ) E.-J. Gilbert. The generic name Imleria honours the Belgian mycologist Louis Imler (1900 - 1993); the older genus name Boletus comes from the Greek bolos, meaning lump of clay, while the specific epithet badia means reddish brown (bay brown!). With its large smooth bay-brown or chestnut coloured cap, Imleria badia is instantly recognisable. When immature, the caps are slightly downy. Growing to between 5 and 15cm in diameter, Bay Bolete caps have firm, pale flesh that turns slightly blue when cut or broken. 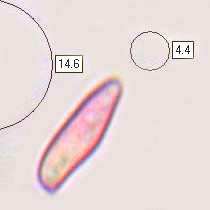 Cap and stem flesh are whitish or sometimes yellowish when first cut through, turning vinaceous just beneath the cap cuticle and slightly blue in the region directly above the tubes and in the stem apex. 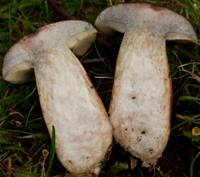 At first pale yellow but usually turning blue when cut, the tubes of the Bay Bolete spaced at 1 to 2 per mm. 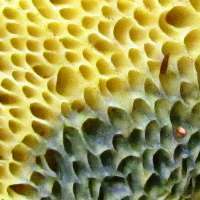 The tubes terminate in pale-yellow angular pores, which (nearly always) turn blue-green when bruised. The colour change is sudden and most marked in mature specimens, and if you touch the pores a deep blue stain is left on your hands. The brown stipe or stem of Imleria badia is covered in fine cottony threads that give it a streaky appearance. There is no ring, and the stem is more or less even in diameter, although often slightly curved, most particularly near to the base. 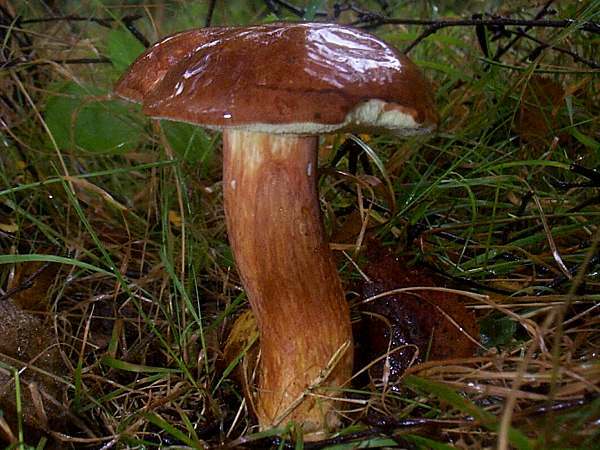 Typically 2 to 3cm in diameter, the stems of this bolete range from 5 to 15cm in height. The flesh inside the stem is white or pale lemon and turns slightly blue when it is cut. Mild tasting; odour not distinctive. Ectomycorrhizal, in mixed woodland, Bay Boletes are particularly common under pines and other conifers but also occur under Beech and many other deciduous broadleaf trees. Boletus edulis, the Cep or Penny Bun Bolete, sometimes has a bay brown cap, but the reticulate net pattern on its pale stem helps to distinguish it from the Bay Bolete Imleria badia. One large Bay Bolete makes a splendid meal for two, because these mushrooms are usually big and chunky. 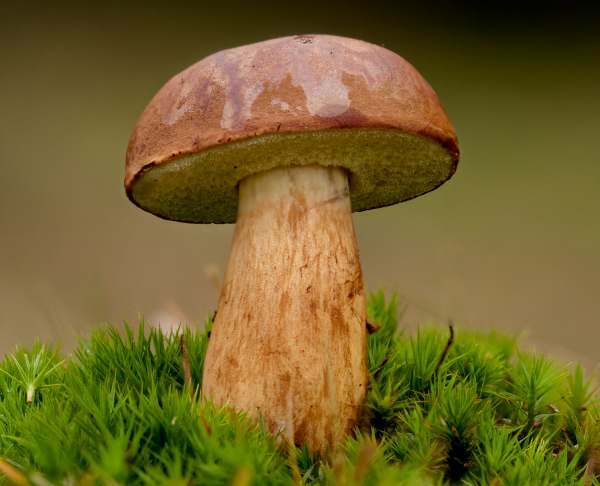 In any recipe that calls for Ceps, Porcini, King Boletes or Penny Bun Boletes (all common names for Boletus edulis) it is perfectly okay to substitute Bay Boletes, and you can be sure that the recipients of the meal will say at least 'not badia'. 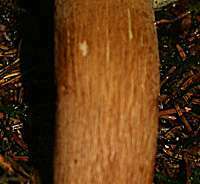 We say that they are very good indeed and close to Ceps' excellence on the scale of esculence. Bay Boletes dry very easily for storage if they are first cut into thin vertical slices; alternatively they can be sliced or chopped into pieces, cooked and then frozen for later use. Roy Watling and Alan E Hills. (2005). Boletes and their allies (revised and enlarged edition), - in: Henderson, D.M., Orton, P.D. & Watling, R. [eds]. British Fungus Flora. Agarics and boleti. Vol. 1. Royal Botanic Garden, Edinburgh.